Welcome to Scotland, a country famous for its whisky, the Highlands, its castles, and, of course...its ghosts! 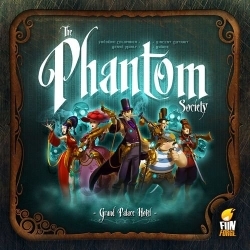 The Phantom Society is a ghost-hunting game in which you play as sly spirits seeking to ruin a manor hotel or, if you prefer, intrepid ectoplasm hunters who are a bit destructive around the edges but who also never falter in pursuit of their prey. For the ghosts, the goal is to inflict at least damage on the manor, whether it is inflicted by the ghosts or the hunters. The ghost hunters want to stop the ghosts before they achieve their objective. The dual-level game board represents a manor floor composed of 36 rooms, with each room being a tile representing a value; each of the four ghosts corresponds to a room type and will hide beneath a tile of this type, starting its devastation of the hotel by removing tiles adjacent to the one it's hidden beneath. The ghost hunters must try to determine where the ghosts are hiding based upon the tiles destroyed. While doing this, though, the ghost hunters will also remove tiles - thus destroying them and adding to the total damage - to see whether a ghost is hidden beneath. The ghost hunters must think carefully and logically over which tiles to remove while the ghosts have to use cunning and psychology in order to cloud their investigation and remain concealed. Will the manor come through this madness intact?